Trans event number 4 for me. They seem to start the same each time: I’ve got a nice organised kit bag with different types of riding kit in separate plastic bags, a nice clean well fettled bike and an anxious feeling about riding nearly 300 miles in a week. First thing is to catch up with friends / rivals at the pre-race pasta party where we were offered a selection of different coloured pasta including the bizarre chilli con carne flavour which was only outdone by the daily pasta later in the week being wasabi flavour! Rude start to the day. Breakfast starts being served at 6:30am and it’s best to get in early as a full cooked and cereal needs time to settle before the 9am start. Once you’re fed it’s the usual (soon to be) routine of packing all you stuff into the large kit bag you’re supplied with dragging it out of your tent and packing the tent away, an easy task when it’s dry like today but can become a chore if it’s raining as tents are especially reluctant to pack away quickly while wet. The kit bag and tent then go on a lorry to be transported to the next overnight camp so all you need to carry is enough food, water, clothes and spares to get you through the day. It’s the start for the first of the timed special stages. The way these events work is that for most of the day due to the arcane right of way laws we’re not actually racing. When we start each day the start-line briefing includes what to expect, what distances the water and lunch stops are at and the magical cut off time. These are very generous and are usually based on an average riding speed of 12km/h (7.5 mph) so for today we have 6.5 hours to get to the overnight stop. Any later than that and you start incurring a penalty of 1second for every minute over the time limit. Anyway back in this queue, we’re at the bottom of a hill and as this stage is the hill climb it can only mean one thing: pain! It’s surprising how hard you can make riding 1km and gaining about 100metres. Right from the start it was pretty steep and just got worse and more technical with the mid section like riding over a set of shale moguls, I passed a couple of guys here having to pick the less desirable line to get by. The track then headed on to a moorland track edged with ferns, got by another guy and the finish came into view. Cross line, collapse and watch the others who set off behind you struggle their way up. Once I’d caught my breath it was on with the ride (there’s still 60k to go). Nice moorland descent and a tarmac section past Hundred House then it’s a right turn I know well, UP. Tarmac to start with then out onto the moorland again gaining about 300 metres of height in not enough distance for it to be comfortable. Quick left / right round a couple of gates and I catch up a bunch of confused looking riders, the orange arrows we’ve been following seem absent. Dave Langridge catches up and a group decision to retrace our track is taken, that left / right, should have been left / left and we descend to the A44. Tarmac doesn’t last long and we’re soon on a fire road and passing the strangely named Water-break-its-neck waterfall and going uphill again for a long drag. As we top out I half think I know where we are from last year’s event but as there’s no marker arrow telling me otherwise I stay on the fire road and start heading down hill again, then the marker arrows go AWOL again and another group of confused riders gather at the bottom of the hill. Again we retrace our tracks back up to the top of the hill where someone has found the missing marker arrow and re-erected it. Oh well, I really wanted a fast 2km downhill and 2km hill climb. It’s not like this thing is very hard to start with. A big open moorland crossing and a blistering fast but not very technical fire road descent later and it’s the first lunch stop. Sabotage is in the air; the ladies there had encountered a grumpy walker complaining about all the bikes that are around today! Weirdly I seem to spend the rest of the day riding on my own and opening and closing gates for no one but myself until I catch up with one of the 70+ year old riders somewhere above Knighton. A quick road descent later and I’m at our overnight camp on the Knighton football clubs pitch complete with regulation cold showers. Sit around in the sun reading, have dinner (pork loin with cider sauce) then it’s time for the results from this mornings special stage and the overall standings to be announced. As it’s the first day whoever wins each category automatically also becomes the category leader complete with leaders jersey for the next day. The jersey isn’t a very good fit but somehow I won the stage by 1.65 seconds. It’s all very tight though as 4th place is just under 5 seconds slower than me. If you were sensible you’d go the quick way from Knighton to Clun and as it's only 7 miles you’d hope to be there in about half an hour. Instead we’re not doing that and the route today will take us 37 miles. Still the weather’s looking good. I even thought to scrounge some sun cream off a ginger camping neighbour who was emulsioning himself. Out of camp, over the river Teme and we’re in England for the day and straight up the steepest hill you’ve ever pushed a bike up. Some nice loamy tracks on top and then an equally steep downhill drops us onto tarmac and then bridleway for a climb up to Stow Hil. On the way down I stop to have an energy bar for the upcoming special stage only to find that a couple of hundred yards later I’m at the start of said special stage. It looks like either the special stage moved or someone got the distances wrong. This special stage in Bucknell Woods is a bit of a mixed bag, we’re going down the top half of a downhill course then coming back up to the start on a fire road. I give it my best on the way down but I’m way too cautious and spend most of it warming up my brake pads and getting all the wrong lines, make up some time and finally overtake a few people on the way back up. I wasn’t thinking of keeping this leaders jersey for the whole week anyway. Some more typical TransWales track follows for the rest of the morning, fire road up and down, but after lunch things get decidedly English with some nice loose wooded singletrack riding alongside fields of barley. 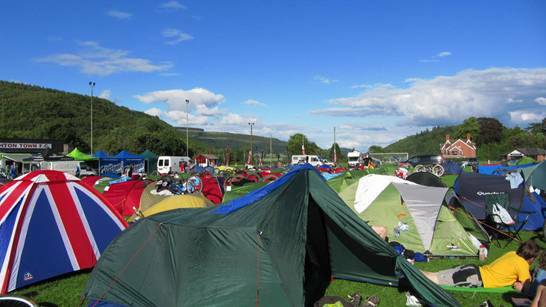 We even pass the splendid Walcot Hall and joke about getting an upgrade from our tents. We’re following the Jack Mytton way now through some more fire roads and proper mountain bike trails above Clun, then pop out on the road and have a mad downhill on the tarmac chasing after and drafting the odd car that manages to get between groups of riders. Down in Clun we’re on another football pitch but no cold showers today as we’re using the event showers which they tow from site to site, these are really good and run off a gigantic diesel genny. Curry night tonight and it came with the strangest nan bread you’ve ever seen, kind of like one of those big bowl shaped Yorkshire puddings but it’s naan bread. Filling it up with curry I guess was the idea but while we’re waiting for fresh supplies of rice in the queue I’ve eaten it, more room for curry on my paper plate then. Special stage results and overall standing are announced once everybody has eaten. I’m pleasantly surprised to have come 3rd in the special stage, it must have been the uphill bit that kept me in the running. The leaders jersey goes to Andrew Jones from Clee cycles. He was second yesterday and I’m down to 3rd. I’ll be back (I hope). Coats on and then very quickly off again as the first few miles are straight uphill on a tarmac climb out of Clun. Then we’re off road still going uphill and following Offa's Dyke which must mean Wales is near by. A quick off road and back lane descent over the border at Lloyney and back into Wales for the rest of the week. Now we’re on another of those steep hill climbs. Some brave souls ride it all only to leave themselves running on empty for the rest of the day. As the hill tops out we follow the ridge line along a track with an indecent amount of sheep droppings on it; can’t actually see that many sheep to have left it all though. Worrying about it doesn’t last long as it's raining again and getting breezy even though it’s supposed to be summer. I’m not hanging around up here (we top out at 528m). I console myself when I pass two Spanish guys looking thoroughly miserable. I suspect they’re wondering what they’ve signed up for. This was a good downhill last year but not being able to see properly because of the spray then losing the rest of our height on back roads to eventually cross the A483 at Llanbadarn Fynydd doesn’t do much to warm me up. Another big off road climb back up to the moorland does though. 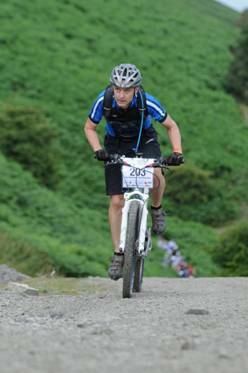 I walk a steep bit after a gate for a while then spot the event photographer snapping away so jump back on sharpish as I don’t want photos of me pushing bikes out there for all to see. The climb tops out with tarmac and a brief run along a country lane. It doesn’t last long and were off into a forest and up Red Lion Hill, it’s stopped raining now so the coat comes off for the rest of the day. What follows is a rapid descent down a narrow loose track ducking branches all the way down. Pretty soon it’s the lunch stop and not too soon after I’m starting to feel a bit hollow. Unfortunately lunch is at the bottom of another big climb: up a fire road and back into a forest and a few switchbacks later we’re back on the road for a good few miles of quiet lanes. Down a bridleway and into a forest above Llanidloes we can occasionally spot our overnight camp but it’s a good way below us and we appear to be riding past it. A big loop later and I’m jet washing my bike back at camp next to the river Severn at Llanidloes Rugby pitch with 41 miles more in my legs. Dinner is Cumberland sausage & gravy as there’s been no special stage today (the only day without one) it’s an early night. This is one I’ve been both looking forward to (linking stage) and kind of dreading (special stage). 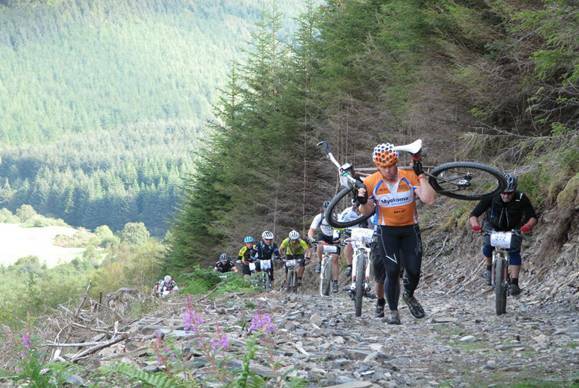 The special stage is all downhill at the Climachx trail near Machynllyth. It starts off tame enough with rolling singletrack but quickly heads downhill. But that’s a long way off yet. 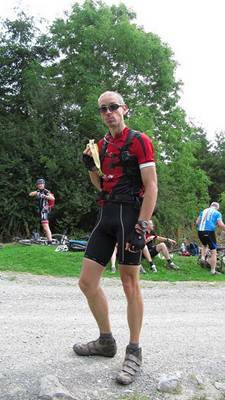 There’s 40 miles of linking stage to do first and it's a good one that we did last year. Following the Severn valley until the Severn becomes a little stream and we’re not far from it’s source we go gradually uphill for about 11 miles into Hafren Forest and back onto more fire roads. A reward is a two mile downhill. Gary Cousins has a pretty spectacular tumble here and smashes hit helmet and bashes himself up, he’s OK but won’t be chatting AND going downhill at the same time again after bumping handlebars on the way down. A quick bit of tarmac down to either Staylittle (if you’re English) or Penfford-Lâs (if you’re Welsh) then back off road and up onto the moorland following Glyndŵr’s Way. 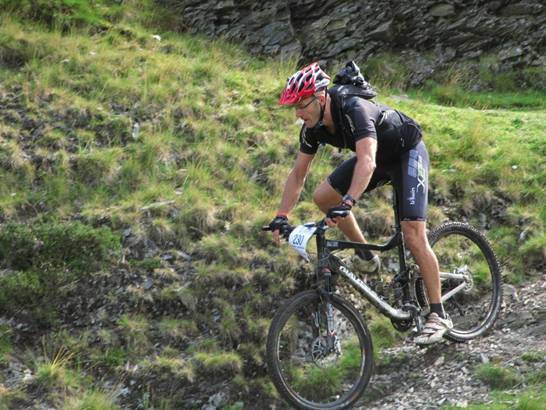 This starts off as a grassy climb then onto the broken slate singletrack then downhill quickly on slabs of very slippy slate heading for a narrow bridge. The braver riders clean it all. I had a technical dab part way down and it’s too steep to get back so walk down and take a few pictures of the other riders. Another short climb and we’re passing Glaslyn Lake which means we’ve topped out and have the downhill off Foel Fadian coming up. This is a super steep shale and slate slab run down which looks like it has precious little grip. I ride most of it finding some purchase on the line of least resistance following the water running down it. The rock gives way to a very quick down on grass tracks at the gate. Part way down the smell of my cooking brake pads is overpowering so I give them a dousing with high5 to cool them down before carrying on down for a few more miles of tarmac heading to the lunch stop. A nice downhill with a ford at the bottom then a nasty loose climb which has the singlespeeders off and walking which means lunch is well earned. Some more back lanes a run along the main A470 and I hook up with Dave to ride up into the back of Dyfi forest. I’m taking it easy because I know the special stage isn’t far off but a 15 minute push up a 1 in 3 dirt track doesn’t help in keeping my heart rate down. We’re able to get our singletrack eyes in on some good man made trails leading up to the start line for the special stage. At the start line the best bet is to give whoever sets off before you as bigger head start as possible to avoid catching them up on a bit of trail where there’s no room to pass. I do that, but it doesn’t matter as I pass no one. I do briefly see the rider ahead of me on the section of trail where pedalling rather than gravity and fearlessness is in order. Once the trail starts to head downhill properly my light bike and heavy braking technique don’t make for a very smooth run down and I actually come to a halt in the infamous rock garden half way down. After the special stage finish it’s a gentle warm down along the valley, a quick dice with the market day traffic in Machynllyth and we’re at camp. Showers today are in the local leisure centre so we all get some funny looks from people coming out of the pool to be greeted by muddy mountain bikers. Steak pie is on the menu tonight. I see a guy perform an act of engineering brilliance by getting the most food I’ve ever seen on one paper plate by cunning use of mashed potato as some kind of mortar to hold the huge pile of food together. Prize giving comes and goes without me bothering the podium at all I was 5th in my category on the special stage which also puts me 4th overall with 1 minutes 26 seconds to make up to get back on the top step. Another bright start I think I’ve come to the wrong event. It’s always been raining most of the time on past events. We steadily climb on tarmac and then fire roads up into the forest and then up a very steep newly cut fire road which I’m sure even the logging lorries can’t use, maybe it’s there to make our day harder? As we top out we’re now following an old drovers road and heading for the banks of Nant y Moch reservoir on the way is a river crossing that has legendary tales told about it from the 2008 event. That year we were riding through the wettest August on record and the river crossing was a 3 foot deep raging torrent, this time it’s a pretty tame foot or so deep and I’m across without even a dab, still got two wet feet though. The first water stop is down on the dam then it’s just a few more km of drovers roads and some trail centre type stuff until we get to the start of today’s special stage at Nant-yr-arian. 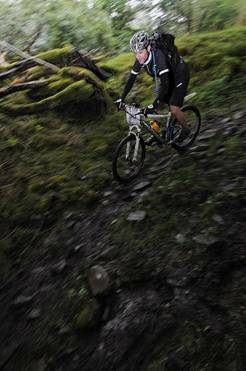 The stage starts at the top of the forest and descends on old farm tracks with huge puddles then picks off some of the best man made trails in the forest while all the time heading you downhill. As you bottom out there’s then two miles straight up a fire road gaining about 200m of elevation, it’s not called the leg burner for nothing. I have to say I love this stage and set off like a loonie chasing after the riders who’ve set off before me. I catch a couple on the downhill and one more just before we hit the singletrack. Then in the swoopy singletrack I’m shouting at myself for making silly mistakes or not riding hard enough at the bottom of the leg burner I catch my breath briefly and dig in for the climb. It’s horrible and I max my heart rate out for the whole climb overtaking quite a few people on the way. At the finish it takes 5 minutes lying in the grass verge while hyperventilating for me to recover and then get myself some lunch. I think I’ve given it all I could but will have to wait until this evening to see how well I’ve done. As we’re back at the top of the forest there’s more swoopy singletrack all the way down to the visitor centre where some riders take the opportunity to grab a cheeky espresso. But for me it’s down the road to Ponterwyd and a long off road climb up to the edge of Arch forest. Right at the top we can just about see the sea out beyond Aberystwyth. Tent’s up and I’ve had a brew and a bit of a kip so it must be dinner time. The breeze has dropped and guess who’s back? The midges. Leg it to the marquee and there’s a full Sunday dinner on offer, roast turkey with all the trimmings. Sensibly the prizes are given for today special stage inside the marquee tonight and all that effort was worth it. I won the stage and made up 50 seconds on the overall vets leader and got myself up to second place. Then the organisers pulled a surprise out of the bag. They’d got a trailer full of beer up to the camp and laid on a local band to entertain us! Once we’ve finished trying to dodge the midges while packing our stuff away it’s a gentle run down the valley and then mass confusion as half the riders miss a marker arrow. The farmer whose farm we pass through as a large bunch all come through at once isn’t that impressed especially when some people start climbing over a locked gate rather than using the bridleway gate as marked out. We then climb up some forest track and break out into expansive views across Ceredigion back towards the sea. Eventually after some grassy climbing we pop out onto a narrow road and do the roller coaster climb that does more up than down towards Teifi Ponds. Ponds isn’t a very accurate description there are some pretty big lakes and reservoirs here in an area that seems incredibly remote. After a quick water and banana stop, it’s down across marshy tracks and along the river to the least Welsh sounding place in Wales, Strata Florida. it’s close to the village of Pontrhydfendigaid whose name redresses the Welshness of the area. Then it’s up again on good technical climb that’s popular with the local 4x4 drivers and we’re heading for the top of Tywi forest. As we tip off the summit what lies ahead is locally know as the splashes. A good 4x4 track with multiple crossings of the river Towi, 14 in all but that doesn’t include the big puddles left over from when the river decides to just run along the track. It’s good fun as long as it’s not cold and you accept that at least your feet are going to get wet, more if you mess up on one of the fords and fall in. Lunch comes up quickly then it’s a big tarmac climb over to Soar y Mynydd chapel then off road and another beast of a climb (cleaned it!) to get us up above the Doethie valley. A quick and loose descent drops us into the valley proper then it’s all singletrack for 5 miles. Some of it really good other parts are a bit hike-a-bike around bogs. 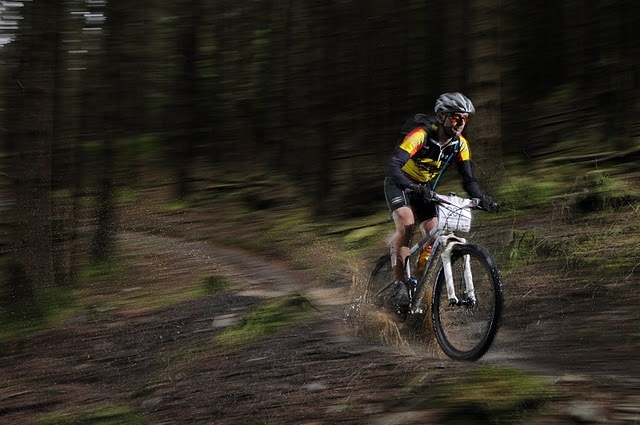 A few more miles on the road and we pass the venue for this evenings night stage at Cwm-y-Rhaiadr: a small forest with a good purpose built MTB trail that takes you up on a mixture of fire roads and singletrack then 3km back down on bermed flowing singletrack. Minted lamb for dinner tonight but I don’t want to have too much as the special stage kicks off at 9pm and as we’re setting of in position order at 30 second intervals I’ve got the 9:04 slot. After dinner there’s time for a quick bike fettle and change back into riding clothes and at about 8:30 I head the mile or so down the road to Cwm-y-Rhaiadr. They’ve set up a start ramp on the back of trailer and in the drizzle it’s a tough job getting you and you bike up there in the 30 second gap with falling off on the wet aluminium checkerplate. I get a countdown from 10 and I’m away up the fire road as fast as my lungs will let me. I briefly think I’ve gone the wrong way as I start heading downhill on the fire road but at least gives me chance to catch my breath for the singletrack climb. I can see lights weaving their way up ahead. There’s a marshall at the bottom and he reckons I’m closing on my 30 second guy, the singletrack is even steeper but I can see the next rider tantalisingly a turn or two ahead. At the top I get a quick chance to wipe the rain off the clear glasses that I wish I’d left behind as I can’t see a thing with the fine rain that’s falling. As I start the downhill section it’s all pretty much as I remember it...random drop offs come at you with no warning. In the daylight I’m sure I’d think twice about them if I could tell how high they were but right now it’s just jump off and hope for the best. Into the tight turns I miss one corner but get away with it by riding over some tree roots to get back on track. Further down I go into a unexpectedly tight corner too fast and have to brake to a standstill to avoid going off piste and now I’ve been caught by the next rider off the ramp and I’m getting annoyed with myself for riding like knob. I try to hold off this guy but he’s flying and pushing me beyond my comfort zone, fortunately there’s a wide area of track where he gets by and disappears. This just leaves me thinking I’m riding a really bad stage and at the bottom I just grab the coat and bits I’d left at the start and head back to camp to sulk. I think I’ve blown it and have a rubbish night’s kip as a result. As yesterdays night stage probably ending at about 10:30pm we’re having a late start and they’re announcing the results after breakfast, I’m not hopefull. 3rd and 2nd stage placing get announced for my cat and the current overall leader has taken the 2nd place. I can’t believe it. I was convinced I’d done a really bad run but I’ve taken the win by 35 seconds (it must’ve all been on the climb). As Exposure Lights sponsor the stage I’ve also picked a brand new helmet light worth about £180. Now the gap between me and first place is only a second, trouble is today’s special stage is a very short up and down, last year it took me just over 6 and a half minutes to complete. It’s raining as we set off but is at least warm so I’ve gone for arm warmers and short sleeved shirt. The long tarmac climb out of the valley keeps me warm and then further up into forest above Llanwrtyd Wells. 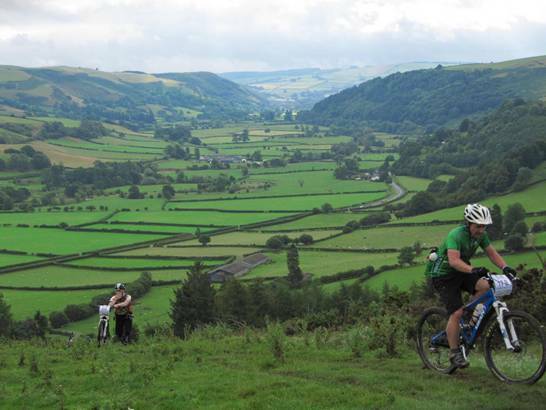 We drop down some spectacular trails and into the back of Llanwrtyd Wells where there’s a water stop for us. Then it’s back up again and into Irfon Forest we start out on fire road (again) but then pick up some seemingly abandoned (or well bedded in) man made singletrack which eventually drops us down to today’s lunch stop. Then we think it’s all going to be quite lanes back to Builth but John Lloyd throws a curveball and sends us up a wickedly steep shale climb. I start trying to ride then have to have a word with myself as there’s a special stage to do at the end of the day so I get off and walk. Back down the other side of the hill and now we’re on back roads for a good while and then the main road through Builth. I try to cruise along rather than pushing the pace and stop for a energy bar which I hope will kick in in time for the special stage. At the finish there’s time to dump excess kit and give the bike a bit of TLC before you set off on the timed stage. No order this time; just go when you’re ready. Richard who I’ve been riding with on and off all week goes off before me and as he finishes tips me off on a good line to take part way round the course. It might only shave off a couple of seconds but I only need one! It’s a cobbly climb to start but there’s plenty of grip as the earlier rain hasn’t made it as far down the valley as Builth so conditions are ideal. Then it’s into the woods for some nice loamy track and I start heading downhill. I’m pushing hard and a weeks worth of riding is showing as I’m drifting the bike round corners. Out of the woods and some swooping bends down a field. The final corner behind the portaloos is a tricky one with a drop off preceding it, come in too fast and the bike will disappear from under you. I take it easy then gun it down the finishing straight. Now the nervous bit, there’s a couple of hours to kill before final prize giving so time for a shower, jet wash the bike and pitch the tent to dry it out. All week the vets cat has been announced last and today’s no different. Third place surprisingly goes to the Andy Jones who up to now has been leading since day 2 and is the guy with 1 second lead over me. Second is another Andy. They’re running out of steps on the podium so I’m delighted that 1st place is mine in the special stage. While the overall prizes are given for the other cats it dawns on me that as I’ve won the stage and beaten Andy Jones on the day that I’m going to bag the overall win. 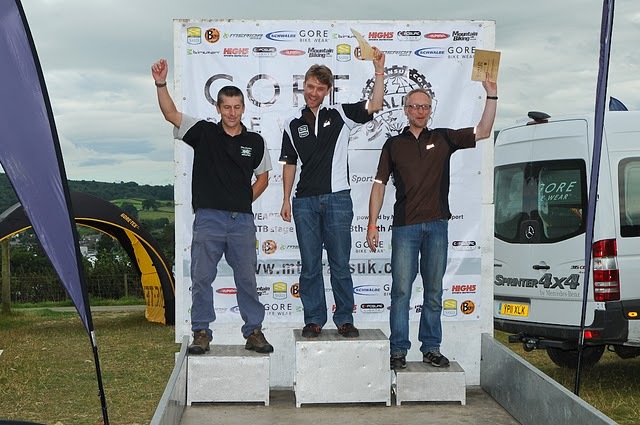 Another trip up to the top step and a winners jersey for me plus a nice cash prize of £200 which added to the vouchers for Gore Clothing I’ve picked up through the week leaves me just about in the black given how expensive the race entry is. In the end the overall the gap between me and second place was 13.32 seconds. I made up that second and a few more.